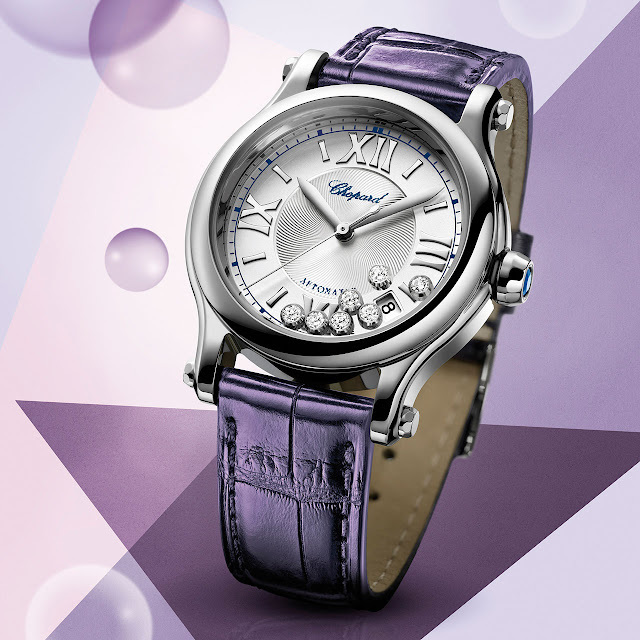 In 1993, Caroline Scheufele created what would become one of Chopard's iconic timepieces, the Happy Sport. In 2013, to celebrate the anniversary of these freely moving diamonds that hover above exquisite dials, Chopard unveils the new Happy Sport Medium Automatic and at the same time adds a mechanical movement to the collection. This new interpretation has all the elegance and sophistication of the original Happy Sport. The silver-toned dial is embellished with a classic guilloché motif and wonderfully accentuates the sparkle of the seven moving diamonds. Turn it over, and the sapphire crystal back reveals the automatic mechanical movement with its straight-line "Côtes de Genève" motif. The 36mm steel case is set on an alligator strap.